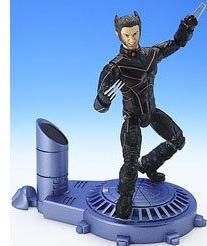 X-MEN II: Danger Room Wolverine - Super Poseable - 6"
Size (inches): 5.91" X 3.94" X 1.97"
A new breed of men has emerged. They are the Children of the Atom, Homo superior, individuals gifted with strange and fantastic abilities simply by virtue of their genetic makeup. A group of these mutants known as the X-Men stand in defense of a world on the brink of genetic war! Kids can recreate the spectacular battle scenes between the X-Men and their foes seen in the hit motion picture with these 6" fully posable, incredibly sculpted action figures. Each character has a unique battle action feature or comes with an accessory as seen in the motion picture. More Photographs - X-MEN II: Danger Room Wolverine - Super Poseable - 6"
End of More Photographs - X-MEN II: Danger Room Wolverine - Super Poseable - 6"